We Build And Install Custom Audio Systems! We build custom boom boxes and install them. 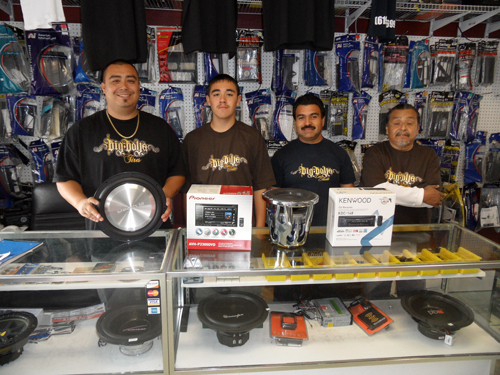 Our years of experience make us the best choice for your custom car audio needs. Feel free to look through our site and see some samples of our work. We do clean, professional installations, and we know you’ll be happy with our work. We are Open Tuesday through Saturday 11:00 am – 6:00 pm. For a quote or to simply discuss what you need, give us a call at the number below. AUG 13, 2013 – We Now Offer Easy Financing, Bad Credit or No Credit Accepted… Click Here For Details! Update: September 27, 2017 – Big Boyz has now brought the delicious taste of Tijuana to San Diego! Visit our Big Boyz Tacos cart and savor delicious Tijuana-Style tacos that feature steak that has been cooked over real charcoal for the very best flavor. Visit the Big Boyz Tacos page for full details.